We enjoy receiving feedback from our clients. 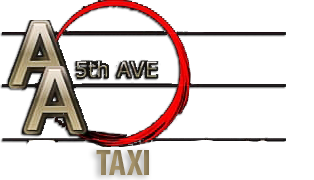 Check out AA 5TH AVENUE TAXI testimonials from some of our previous passengers. "What can I say about AA 5th Avenue Taxi that isn't great? Super punctual, super clean vehicles, and SUPERIOR SERVICE. You will get where you are going with AA 5th Ave.Taxi, and...you will get there on time. They know the area, they know the weather, they know the traffic flow, they know where to shop and they know how to save you money too. You know how some cab companies take advantage of visitors by taking the long way to increase your fare? Well, this company does the opposite. They find shortcuts to save you time and money. It's like YOU become part of their family. They really care about your safety, and YOU! So what are you waiting for? Just pick up the phone and call them up...Going out for a couple of drinks, and want to be safe? Just call AA 5th Ave. Taxi and get ROYAL SERVICE. They will keep you safe and your driving record too. Whether you are a local, or a tourist...you become like family. They go everywhere too, you will get there IN STYLE & CLASS: 5 STARS!!!" "Very reliable company! And by the way these taxis smell clean are disinfected daily there wiped down after each shift, inside and out. Also the drivers are clean and uniform. with all the viruses going around these days I'm glad to find a company that cares for there passengers health. Thank you so much for leaving me with money left over i like the fair rates that this company charges!!" "I am Satisfied with this company because they're the first taxi / shuttle company that i found to be RELIABLE,CLEAN,ON TIME & PROFESSIONAL with VERY FAIR RATES!!!!! ...I also appreciated the video/tv & surround sound stereo system ...This is the only taxi i will ride with after my experience !!! -Thank-You So Much." - Monika. "This taxi company receives my highest recommendation. Great professional service, combined with friendly service from Rocky, the owner, and his associates. I will use this company anytime, for any business I may need." - Diana. "This company is amazing. My work transport was down and they had a ride to me in 20 minutes. I highly recommend them. " "The cab was very nice, spacious, clean, friendly company. (Some of which are also hard to find where I am from. Sad but, true.) When & if I need to use a cab company again i WILL BE calling you guys. THANKS SO MUCH." "I've used AA 5th Avenue for years. They are fantastic. Clean cars and clean drivers. Always on time. I will never use another company. Rocky is the best. Very friendly and entertaining." "Very good and reliable company, always on time, very competitive fees, honest drivers that you can hold a conversation with, plus you get the luxury of nice and clean transportation, no reason to call the rest , these guys are the best. Day or night 24-7 they are there if you need them." "The best company in the area. Rocky is the reason why!!" If you would like to send in a testimonial, please email it to us at info@aa5thavenuetaxi.com with testimonial as the subject. Thank you.